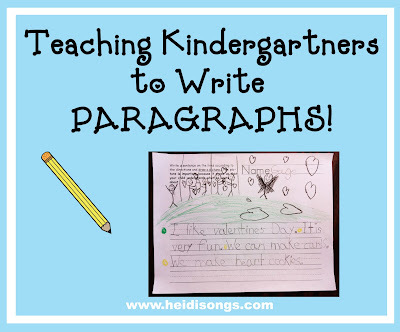 Today I am going to tell you how I am teaching my students to begin to write PARAGRAPHS! (Yes, you read that correctly- paragraphs! It could happen!) They are very short paragraphs, but they are still paragraphs, none the less! 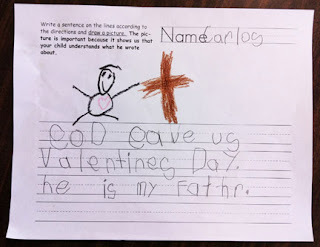 Okay, some of them have only two sentences, but hey- this is kindergarten, for goodness sake! These are Kimmie Butkus’ Fishy Hearts! 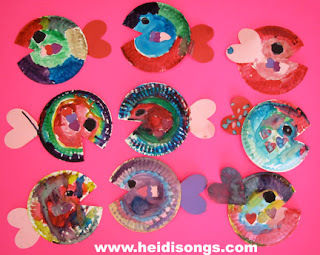 Along the way, I would like to post some pictures of our little “Fishy Hearts” that my class made. I am especially proud of this project, because my “baby” Kimmie came up with the idea for this art project! She will be 21 years old this month, and is studying to become a teacher. This is my daughter Kimmie with one of her best little friends! Doesn’t she look a lot like her mother? We gave the kids a one inch black square to form the eye; all they had to do was cut off the corners of that square to form a circle. 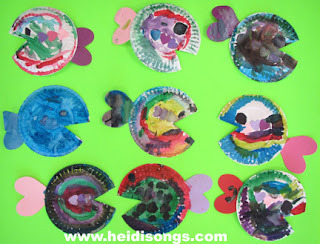 After that, the children used water colors to paint the fish. It was a wonderful project, and went right along with a book that I found called, My Heart is Like a Zoo by Michael Hall. 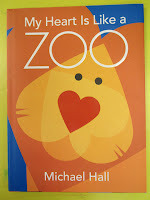 In this book, the author/illustrator uses hearts to create a whole zoo full of animals. The children enjoyed the book, and then LOVED making their “Fishy Hearts!” So three cheers for Kimmie! By the way, Kimmie is also the soloist on all of my albums so far, so if you ever hear a solo voice in one of my CD’s, you are hearing my daughter Kimmie singing! She sang on the Addition Doubles Song on Musical Math, for instance. Last year in a blog entry, I posted a Writing Rubric that I had created to include on my presentation called, “Developmentally Appropriate Ways to Get Kindergartners Writing.” I adapted my version of this writing rubric from one that was originally made by a teacher from my district that is now retired. I made some changes that I thought were appropriate, and added my own artwork that I based on writing samples that I had collected over the years. 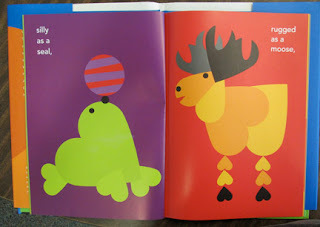 This is a sample page from the book. One problem with this rubric is that it only addressed writing conventions, and did not address the problem of staying on topic. So for example, if a child that writes the first sentence about lions and the second sentence about Easter Eggs, then there was nothing in the rubric to address this problem. Indeed, many years ago when the original rubric was written, we had only begun to scratch the surface of getting kindergarten students writing enough to even THINK about whether or not they were staying on topic! (In our own defense, we had only half day Kindergarten at that point, and the standards were MUCH lower, as well!) In any case, up to that point, we were pretty glad to have had a legible sentence or two that the child could read back and had illustrated. This is probably why the rubric did not include any notes regarding content. Given that problem, I am revising the rubric that I had posted last year to include a few notes on the content of the child’s writing, and re-posting it here for you today if you are interested. 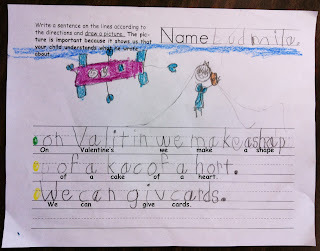 First, we read some books about Valentine’s Day, and then brainstormed a list of things that happen on Valentine’s Day, and what we like about it. 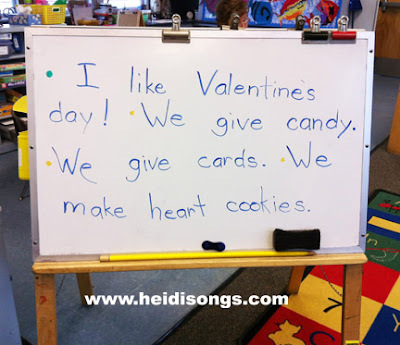 Then, I tried to get the children to give me a “Big Idea Sentence” that would tell us what our story about Valentine’s Day would be mostly about. 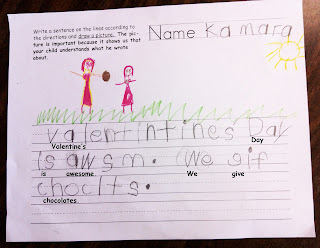 They gave me several ideas, including sentences like, “I like Valentine’s Day,” “Valentine’s Day is Fun,” and “Valentine’s Day is Cool” or “Valentine’s Day is Awesome!” I told them that any of these sentences would work just fine! 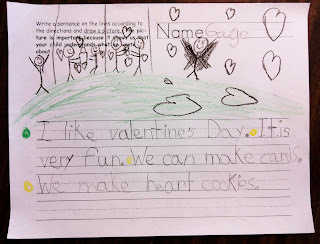 We did have to discuss some of the suggestions that were a bit off, such as the more specific sentences, such as “We give cards on Valentine’s Day.” I kept telling them that I need a “bigger idea,” and tried to point them to a sentence that would tell MORE about the holiday, rather than just one thing about the holiday. I asked them, “Does that tell me one thing about it, or more than that?” We settled on one sentence, and I wrote it down. Then, according to our Step Up To Writing program, we give that sentence a green dot. That is supposed to help the kids organize it in their minds. The green dot sentence is the “Big Idea Sentence.” After that, the supporting sentences get a yellow dot. As you can see, some of the children have started adding their own colored dots to their own writing, too! This is what I demonstrated to my class whole group. Note the colored dots. Then after that, it was easy! All we had to do was think about our list of things that we liked about Valentine’s Day and make up sentences about them. 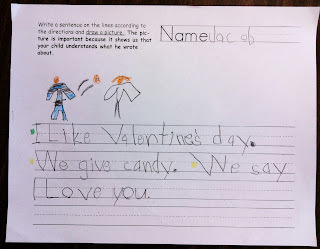 I just had to remind them that, no matter what- the sentences HAD to be about Valentine’s Day!!!! NO MATTER WHAT! Because if we start out talking about Valentine’s Day, then we must keep talking about it, and we can’t start talking about sharks or iguanas, etc. dry erase board next to my table and I wrote on it as they wrote on their papers. Together we sounded out each word and talked about how we might spell and write it, and then they copied my sentence down onto their papers. I let them know that if they dawdle and get behind, they are on their own, and I am not going to help them catch up later. So they had better sit up and follow along and just DO IT! They are a good group this year, and I generally don’t have any trouble getting them to follow along with lessons like this, thankfully! This is how I differentiate my writing lessons for my lowest group. With the group that is one step higher than they are, I get them started with the first sentence, and then release them to finish the second sentence on their own. The top two groups do the whole thing on their own, though I do answer questions and help sound out words as needed. 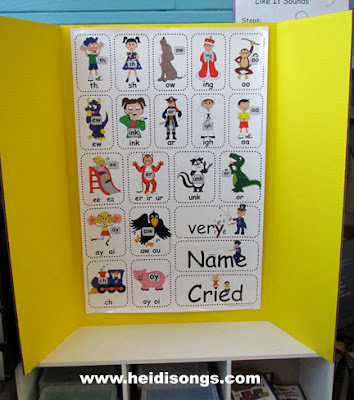 The Sounds Fun Poster, cards, and songs are really a big help when trying to get kids to sound out words and write them down! Here is a look at what the Sounds Fun Phonics DVD looks like, for those of you that are not familiar. This is the Sounds Fun Poster stapled to a Tri-Fold Presentation Board. I can move it around wherever it is needed. None of the children were allowed to copy from the brainstorming list that I made, nor did I allow them to copy from the sentences that I wrote in front of them as a group. I erased the sentence from my white board easel, and the brainstorming list disappeared from the easel the day before sometime during playtime! So all of that was just plain gone. In any case, even if I were to have written the whole thing on a large chart paper, I still wouldn’t have let them copy any of it, because I consider that to be a hindrance to the goal of them learning to sound out words. If I let them copy something, then they will never attempt to sound out those words, and that is a learning opportunity that is lost, in my opinion. Besides that, our school does not have the budget to buy us anymore large chart paper, I have been told! So I guess it all works out that I don’t want them to copy it anyway! It’s just a shame that the children cannot refer back to our shared writing samples later. I wished that I could have clarified what was going on there, but you know how it is in a public school…. We just have to leave it up to children to deliver the lessons that God wants delivered. I hope that enough of them go to Sunday School, Awanas, and Vacation Bible School to make that happen.